A Force to be reckoned with – Delta Force Paintball Guns! 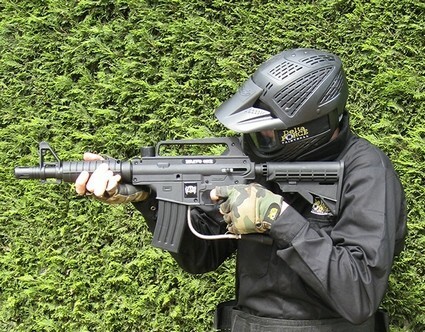 Whilst other paintball providers often use a variety of gun brands at their centres, Delta Force Paintball sticks by the trusted Inferno MKII paintball gun at all national paintball centres in the UK. This way, once a player is used to the weapon’s awesome accuracy, lightweight frame and famed reliability, he or she can build on that experience on each visit. Once you have got to grips with the basics, you’ll be wielding the Inferno like a pro! What’s more, because these paintball guns have been manufactured for maximum efficiency and lightness, stripping down for cleaning and fixing can be done in a jiffy, giving your more time shooting and less time hanging about waiting for your weapon to be repaired. However, there is always a time and place when a little more firepower is needed. 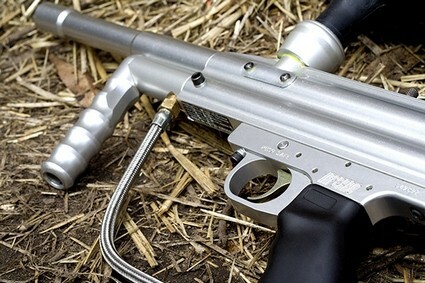 Thankfully, Delta Force Paintball comes up with the goods in that department – in the form of the awesome replica M16 semi-automatic paintball gun. This marker does far more than just look the part, even though it certainly looks mean! Firstly, the 11″ barrel gives it greater range than its counterparts, essential for those who favour long-range battle and the built-in sight only adds to this precision. Next, a collapsible stock spells the end for any uncomfortable handling that comes with other semi-automatic markers, as you can adjust for whatever your gun reach might be or for various shooting styles. Finally, a removable magazine is crucial for outgunning opponents and could be the difference between elimination and being the eliminator. In the heat of the battle, the last thing you want to be doing is fiddling about with hoppers and carefully channelling paintballs – just snap the magazine into the frame and you’re ready to lock ‘n load.